Are Robotic Tattoos Really The Wave Of The Future? Robots are infiltrating our lives and our professions, but will they and other advances in technology eventually threaten our livelihoods? The answer is a resounding yes! What many consider as menial tasks have already become automated. Who needs a live greeter you have to pay and are required by law to give breaks to when you can enlist a hologram? Not enough time to wait in line at a checkout stand? Self-service is just a few aisles over. None of this should come as any real surprise, because Americans saw the handwriting on the walls when industrial assembly lines turned automated. Now, there’s a new infiltrator in town in the form of a robotic tattooer. A French design team that came up with Tatoué, a Makerbot 3D printer with a tattoo gun instead of a plastic extruder back in 2014, has now developed an industrial robot that applies tattoos to humans. It was only a matter of time. Pierre Emm and Johan da Silveira (in conjunction with Autodesk/Pier 9) are behind the invention, and they say that they eventually plan on turning the project into a commercial operation, but that it was not their original goal. "Many of the tattoo artists and studios we have worked with along the way are impatient to get their hands on these machines," the pair has stated. This is actually pretty surprising to hear, when you consider the artistry level of tattooists in this day and age. And artistry is the level the medium has been elevated to, so maybe it’s newbies to the field that are predominantly interested in the concept of a robotic tattoo machine. After all, no real artistic skill is required to tape someone’s leg or arm to a table, set some dials, ensure there’s ink, press a button and then step back and watch as the simple design is applied. I’m not really sure why anyone would opt for this as opposed to a more traditional tattoo experience, but money is a great leveler. Tattoos — at least good ones — are not cheap and, as with everything in life, you get what you pay for. I could see these becoming a big hit at malls, flea markets and fairs. While most people have no qualms about spending hundreds of dollars on athletic shoes and cell phones that will soon wear out and be disposed of, many people have no problem going cheap with something that will permanently alter their body’s appearance. A lifetime of ugly sounds like a poor tradeoff for saving a few bucks. Somehow, I can’t see true fans of ink like athlete Ashlyn Harris, an American soccer player and FIFA Women's World Cup Champion who is currently a goalkeeper for the United States Women's National Soccer Team and Orlando Pride in the National Women's Soccer League, and others like her going this route. 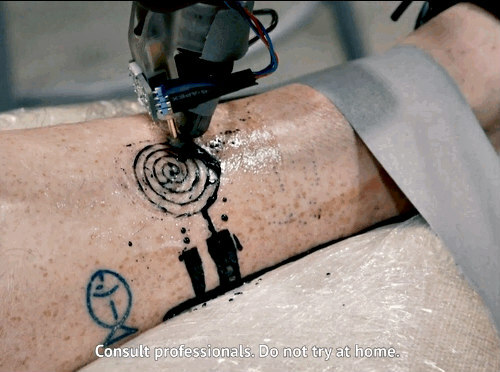 The process of getting tattooed by a robot has just a few steps. First, you create a 3D scan of the target area. Next, operators of the device have to mock up the tattoo design using custom computer software. Finally, as with all tattoos, it’s incredibly important that the recipient stays very still. Also, as with all tattoos, you must initially shave the spot that the tattoo will be applied to and someone must wipe it down at the end, if not from time to time during the process. Emm and da Silveira have noted that the most challenging aspect of the entire project was adapting the robotic arm to work properly on the uneven surfaces of our bodies. "The body is full of surprises; there are no 'flat' parts to be found there," said the duo while recently answering questions.